It all began in 2000. 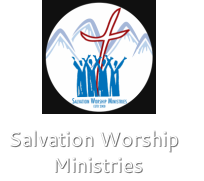 Three young men - Kiran Shrestha, Pankaj Sarkar, and Sunil Thomas Varghese - are the founders of the Salvation Worship Ministries. Nepal needed a team that was dedicated to worshipping God alone. God gradually equipped the Salvation Worship Team and gave a tangible vision to accomplish worshipping Him everywhere, every time. Praise and Worship for the layman is generally meant as a time of enjoyment let alone a time of emptying one's self and magnifying God. A question arose as to who would teach the others in the country (towns and villages) to worship God in the way He wants us to worship him (John 4:24). Salvation Worship Ministries, took a huge step in faith and said, "Yes Lord, we are ready." Based on biblical principles, the team started to reach out to small unnoticed churches dispersed in the outskirts of the Kathmandu valley, imparting the knowledge of worship of God - musically and spritually. And God did wonders! At present, God is using Salvation in an amazing way among the people of the Kathmandu valley - through albums, musical concerts, biblical training at our church, music training at our music school, and the way we live (Romans 16:19).